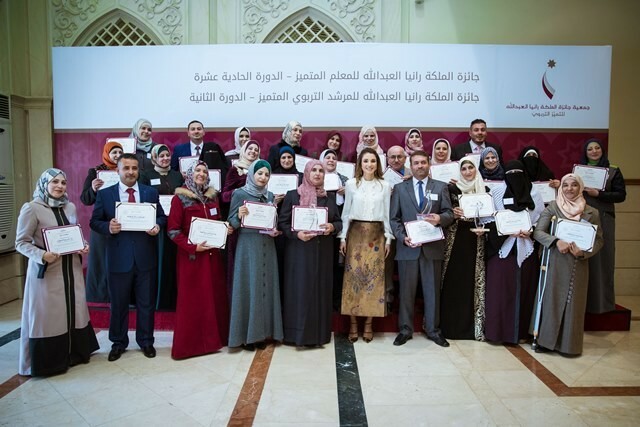 (Office of Her Majesty – Press Department – Amman) - Her Majesty Queen Rania Al Abdullah honored the winners of the 2016 Queen Rania Awards for Excellence in Education (QRAEE) in a ceremony on Tuesday, and urged a collective effort by all education professionals in order to strengthen the Kingdom’s learning landscape. In the award ceremony, held at Al Hussein Youth City’s Palace of Culture, Her Majesty awarded prizes and certificates to winners of the 11th Teacher Award, and the 2nd cycle of the School Counselor Award. Queen Rania underlined that progress in education involves training teachers before and during their employment, and called on teachers to lead what she described as an “educational renaissance” from within their classrooms, and to invite their communities to be a part of this renaissance. “They have proved that there is still room in those packed classrooms for innovative solutions and creative ideas,” she added. Queen Rania stressed that despite the pressing need for an upgrade in Jordan’s educational system, “we maintain our principles and identity, while advancing the sciences and our knowledge.” In this scope, the Queen explained that textbooks should become a partner and a reference for teachers rather than a hindrance limited by rigid style and wording. Launched in 2005 by Their Majesties King Abdullah and Queen Rania in partnership with the Ministry of Education, QRAEE aims to set a national standard of excellence in teaching, and to celebrate, encourage, and honor those who reach it.